One of the culinary delights of summer is corn on the cob. Whether your favorite kernels are yellow, butter and sugar, or white, corn on the cob is sweet hand-held comfort food that goes with dinner, picnics, barbeques, and any summertime party. By now, most places have piles of corn to pick from. Shucks! Today might be the perfect time to cook some up and enjoy! Bob is a fedora- and glasses-wearing squirrel who has his eyes on a lonely piece of corn on the cob. Rob is a party hat-wearing squirrel who’s got his little paws secured around corn on the cob handles and is about to take a bite. You can tell that “these two squirrels love corn on the cob.” A dapper duck and a mannerly, bib-wearing dog does too. (Hey! Who’s that little silver guy looking for Mama?) But rabbit Ella Mae Dobbs, who’s “a bit of a snob” does not like corn on the cob. 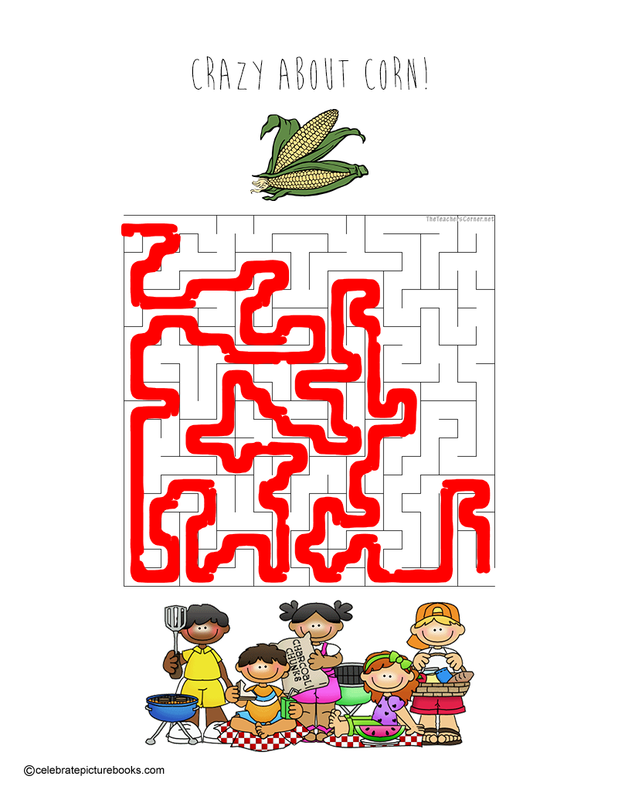 While the robot wants Mama, and Ella Mae wants a kabob, Bob whispers to Rob that he’d like “to see Ella eat corn on the cob.” They offer a deal—Bob will try carrots and Rob will try tofu, but only if Ella tries corn on the cob. But Ella says, “Oh boo.” Bob’s already taken a bit of a carrot, and Rob’s nibbled tofu from a fork. And Ella Mae? She’s contemplating the corn on her plate as the robot peers over the table. Image copyright Todd McQueen, 2104, courtesy of Sky Pony Press. And what about our little robot buddy? He finally found his Mama—a shiny corn cutter and popper all in one! Todd McQueen’s tribute to corn on the cob is a funny read-aloud that—of course!—stars two squirrels eager to chomp into their favorite sweet delicacy. Their wish to share their snack with stubborn Ella Mae sets up a bounding duel of wits that is sure to make kids laugh. 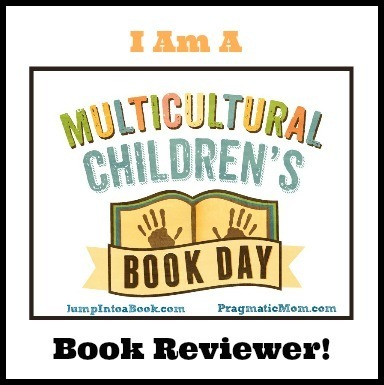 The addition of the little robot who’s lost his mama adds a bit of mystery, and when he suddenly whips up a whopper of a kabob, a surprised “Whoa!” is sure to pop from wide-eyed young readers. The story is a delicious reminder that even if friend’s tastes differ, they can usually find something to agree on. McQueen’s dry wit shines through in his illustrations of various famous corn-eaters trying to attract a very chic and sophisticated rabbit to join in the fun of simple corn on the cob. The shiny robot is a cutie, who kids will love to follow from page to page. The duck and Rob’s obvious dislike of tofu should make little ones giggle, and kids who like counting will be happy with all of the corn cobs waiting to be pointed out. A perfect book to read while munching on popcorn or to take along to a barbeque or picnic, Bob & Rob & Corn on the Cob is just right for free-and-easy summertime reading. A group of friends are having a barbeque, but they need some corn on the cob. 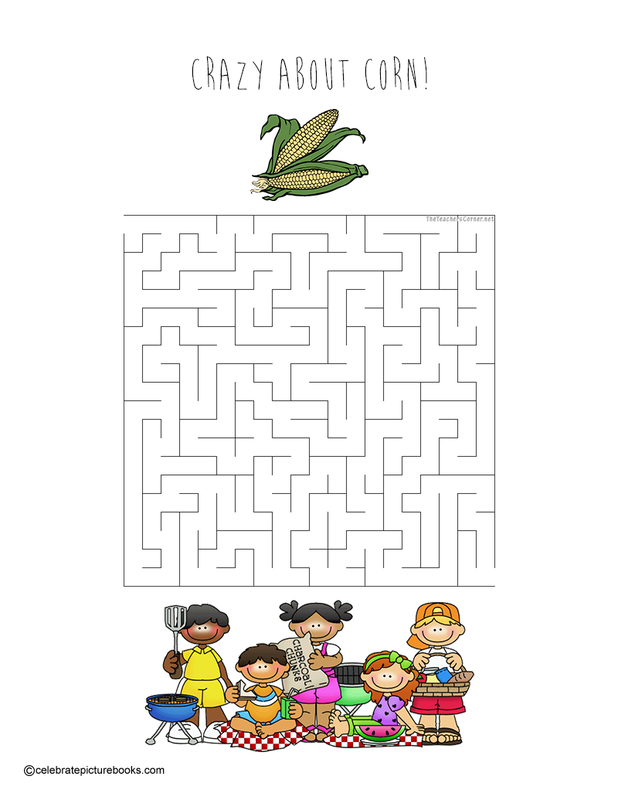 Can you find your way through this printable Crazy about Corn! Maze to deliver it to them? Here’s the Solution!